The marina in Crescent City, California was hit hard by a tsunami resulting from the Japanese earthquake of 2011, which destroyed two-thirds of the harbor’s docks. 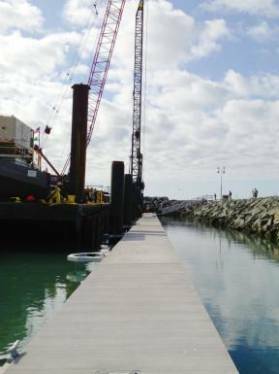 The geographical location of the marina makes it quite susceptible to tsunamis, and as a result the new construction is being billed as “tsunami-resistant” by making the docks strong enough to withstand potential surges. This is an ongoing project, but to date, Portland Bolt has supplied nearly 2,000 3/4” and 1” diameter hot-dip galvanized float rods, both in A36 and A449 grades, and a wide variety of other custom and stock bolts and marine hardware, including 1-1/8” diameter A449 anchor rods and ¾” diameter hex bolts. With our in-house hot-dip galvanizing line, roll-threading capabilities, and our ability to manufacture bolts and rods quickly and correctly, Portland Bolt is an excellent source for marine projects.